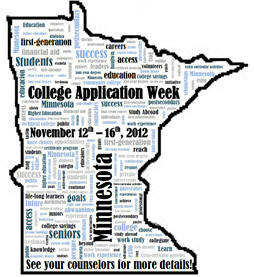 Last year, Governor Mark Dayton proclaimed the second week of November Minnesota College Application Week. This week will provide a framework for high schools and postsecondary institutions to collaborate in a concentrated effort to engage and inform underrepresented (first generation college students, students of color, and low-income) students about the college application process and to highlight college and career readiness efforts occurring throughout the state. Over 100 high schools across the state are registered sites this year. They include high schools, charter and public, in the Twin Cities as well as cities and towns throughout greater Minnesota. This entry was posted in Education, Events and tagged College Application Week by jlmadvocacy. Bookmark the permalink.